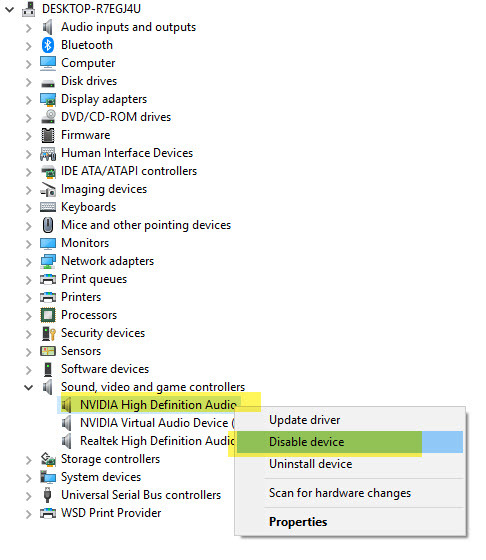 ** Note: Try this also:Uninstall your nvidia high definition audio drivers in device manager if you are not using the audio through the HDMI cable. 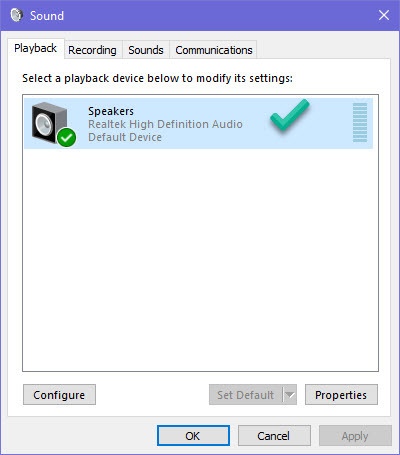 Use your sound card audio instead and get some speakers. 3) It is now disabled. 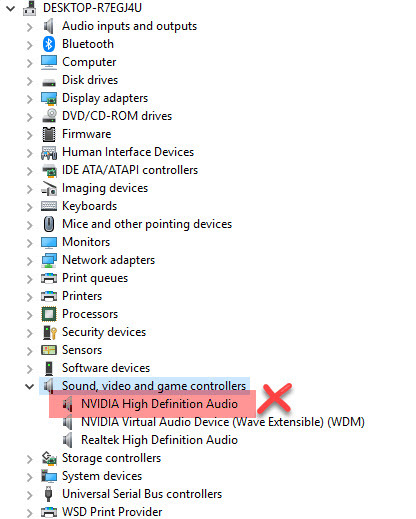 4) Bring up your NVIDIA Control Panel, under Display, click Set up digital audio, and under HDMI, turn off audio. 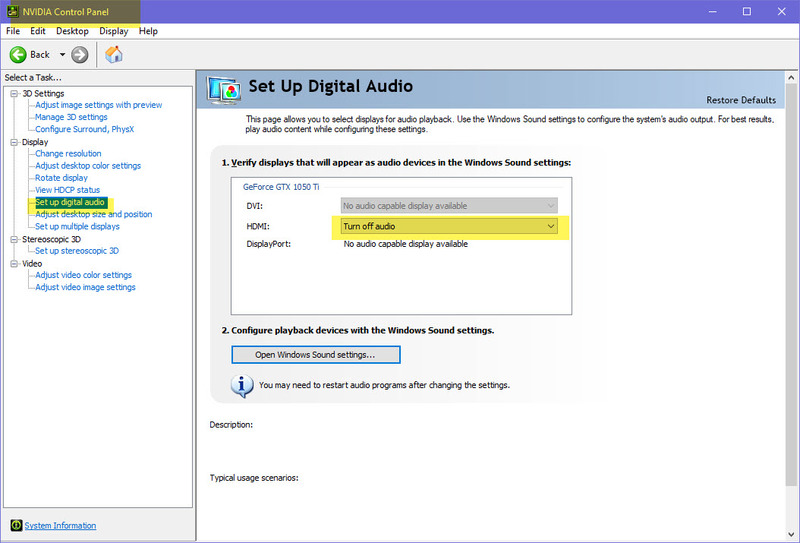 ** Note: Try this also: Delete the TdrDdiDelay and the TdrDelay. Add instead a QWORD (64-bit) or DWORD (23-bit) value called TdrLevel and give it the value of 0. This completely turns of Tdr checker. 1) Rename the nvlddmkm.sys file in your C:\Windows\System32\Drivers folder to nvlddmkm.sys.old. If the file does not exist, then skip step 1. 2) Locate your latest nvlddmkm.sy_ file on your computer using a search tool like FileSeek and copy it to your Desktop. 3) Open the nvlddmkm.sy_ using a tool like 7-Zip and extract the compressed file to your desktop which will be named nvlddmkm.sys. 4) Move the nvlddmkm.sys file from your Desktop to C:\Windows\System32\Drivers. 5) Type regedit in your windows search bar and hit enter. 6) Go to the path “Computer\HKEY_LOCAL_MACHINE\SYSTEM\CurrentControlSet\Control\GraphicsDrivers”. 7) In the right panel, right mouse click and create a new QWORD (64-bit) or DWORD (23-bit) value called TdrDdiDelay and give it the value of 8. Note: TdrDdiDelay – Specifies the number of seconds that the operating system allows threads to leave the driver. After a specified time, the operating system bug-checks the computer with the code VIDEO_TDR_FAILURE (0x116). 8) In the right panel, right mouse click and create a new QWORD (64-bit) or DWORD (23-bit) value called TdrDelay and give it the value of 8. Note: TdrDelay – Specifies the number of seconds that the GPU can delay the preempt request from the GPU scheduler. This is effectively the timeout threshold.